The Chandigarh police has summoned three members of the family of an influential industrialist, living under the jurisdiction of the Sarabha Nagar police station, in connection with the recovery of a man's body from President Hotel, in Chandigarh on December 4. The man, identified as Sachin Bansal, had allegedly committed suicide by consuming celphos tablets with a large amount of liquor. He allegedly had an illicit relationship with a daughter-in-law of the family. Ludhiana police sources claimed that both had allegedly eloped sometime in November from here. However, members of the family claimed that their daughter-in-law had been abducted. A case of abduction was also registered at the Sarabha Nagar police station in November. The case, however, boomranged on the complainants when the abduction-accused mysteriously ended his life in a Chandigarh hotel. While the Chandigarh police had conducted inquest proceedings under Section 174 of the CrPc, the recovery of a suicide note from the man's pocket had not been made public. Ludhiana Tribune has learnt from reliable sources that investigation in the suicide case suggested that the deceased was harassed by the father, the father-in-law and the husband of the woman in question. In his suicide note, Sachin Bansal, begging forgiveness from his parents for his act, had written that he was committing suicide for bringing a bad name to the family by falling in love and absconding with a married woman. The police sources said though the suicide note had not mentioned the name of the industrialist , his family would be quizzed in this regard. The family is now in a quandary. It has immense influence among top bureaucrats and police officers of the state as well the UT police department, yet the note left by Sachin Bansal has put the family in a spot. From being the complainant and aggressive party in the case, it has now become an accused party. The sources said the Chandigarh police wanted to investigate the matter first and then register a case of abetment to suicide. On the directions of the Punjab and Haryana High Court, a city court has initiated an inquiry into the incident that led to the death of a teacher, who had died after falling into an “uncovered manhole in 1999. The inquiry would be conducted by Mr D.R. Arora, Additional District Judge, Ludhiana. The High Court had ordered an inquiry after a writ petition seeking compensation and strict action against the guilty person was filed by the husband of the deceased teacher. Mr Justice G.S. Singhvi and Ms Justice Kiran Anand Lall had ordered an inquiry before finally disposing off the writ petition. “We are of the view that it would be in the interest of justice to get a detailed inquiry conducted into the cause of death of Ms Sarita Walia and the negligence of the Municipal Corporation, if any,” observed the court while passing the order. “Hence, we direct the District Judge, Ludhiana, to nominate one of the Additional District Judges of the Sessions Division, Ludhiana, to make a detailed inquiry into the cause of death of Ms Sarita Walia and also the negligence of the authorities of the Municipal Corporation who may be responsible for having left the manhold uncovered,” says the High Court orders. The tragic incident, which had rocked the city, took place on April 18, 1999, when Ms Sarita Walia, a teacher of New Senior Secondary School, travelling with her husband and son, had stepped out of her car opposite Gurdwara Nanaksar, situated on Ferozepore Road, near Sidhwan Canal, to ease herself. as soon as she stepped on footpath, she fell into a 40-foot deep sewerage manhole which was not covered with a lid. Ms Walia did not notice the manhole as it was thickly covered with grass. The family members of deceased had camped on the roadside for about three days and also blocked the road on the second day of the incident when her body was be found. The badly bloated body of Sarita Walia was found after three days about 4 km from the spot where she had fallen. Following a public outcry over the incident, the then DSP, Sarabha Nagar, had ordered to register a case under Section 304-A of the IPC, on the complaint of Mr Anand Sagar Ahluwalia, husband of the deceased. Thereafter a case was registered and reportedly four MC employees were challaned for not taking care of the uncovered manhole, which resulted into the death of the teacher. That case is pending in the court of Mr Ashok Kapoor, Judicial Magistrate, Ludhiana, and fixed for want of evidence by the prosecution. Mr Anand Sagar Ahluwalia had knocked on the door of High Court, seeking compensation and directions to the government department concerned. The husband of deceased had alleged in his writ petition that the entire incident took place due to the sheer negligence on the part of administration. As the width of manhole was 2 feet x 2 feet and depth was 40 feet, anybody falling into it could not under any circumstances, survive until and unless timely help was provided. But, the complainant said when his wife fell, and he raised a hue and cry, only then the police and fire brigade officials, came on the spot and even then they were not having proper equipment. The High Court expected that the Additional District Judge would, after giving reasonable opportunities to all parties to produce oral and documentary evidence, record his findings and send the report within a period of 2 months. More than 40 acre of municipal land in the Jamalpur area,which was to be handed over to the Punjab Water Supply and Sewerage Board (PWSSB) for the construction of a sewerage treatment plant as a part of the Rs 229-crore Sutlej Action Plan, has become a bone of contention with the two bodies taking divergent stands on the price and the mode of transfer of the land. The civic body had offered the land to the PWSSB for the treatment plant at the cost of Rs 25 lakh per acre. Further, in accordance with a resolution adopted in a general house meeting of the MC on May 18, 2001, the ownership of the land was not to be transferred in the name of the PWSSB and it was to be allowed to commence construction of the project. At that time, the Legal Advisor of the MC had observed in a written report that certain cases, concerning the land, were pending before the Punjab and Haryana High Court and the Divisional Commissioner at Patiala. Due to pending litigations, the civic body could not interfere with the possession of land. Now when the case for the payment of the cost of land, valued at Rs 10 crore according to an MC demand, was moved by the PWSSB authorities, the Punjab Government insisted that the price being demanded should be justified. The PWSSB further made it clear that payment against the cost of land would only be released after the ownership of land was transferred to it. It was learnt that pending ‘justification’ of the cost of land by the civic administration, the PWSSB took up the matter with the SDM (East) to ascertain the market price of the land in question. In his report dated September 19, the SDM (East) intimated the PWSSB that the market price of the land in the Jamalpur area, including the MC land, was in the range of Rs 15 lakh per acre. In the face of a report by the revenue authorities and the competent officer for fixation of land prices, the PWSSB officials felt the demand by the MC of Rs 25 lakh per acre was not justified and the price would have to be scaled down to somewhere near the price indicated by revenue officials. According to MC sources, the issue of revision in price of land could be decided upon by the Finance and Contracts Committee (F&CC) while the transfer of ownership of land to the PWSSB would have to be approved by the general house and the earlier resolution approved in May, last year, would have to be revoked. The much awaited winter rain continues to elude the region as a result of which different problems have started affecting the people and crops in the area. Though clouds have been hovering over the region for the past week or so, there has been no rain, anxiously awaited by farmers and others alike. Ever since harvesting and the burning of paddy straw was over about a month back, the farmers, after having sown the wheat, have been eagerly looking forward to a good spell of rain that would do wonders to their newly-sown crop. Meanwhile, the countryside presents a foggy look in the mornings and the evenings these days as the wheat crop is being extensively watered. Visibility on the highways is also very low, resulting in an upward trend in the number of accidents during the past week. In the absence of rain, the density of smoke and dust particles in the air has reached an all time high after the large-scale burning of paddy stubble throughout the state. Due to this, there has been a rise in the cases of asthma, bronchitis and other respiratory disorders. Cases of common cold and flu are also on a rise. If the prevailing dry cold conditions persist for another couple of weeks, it would not be long before the people take to sorcery and witchcraft to please the rain gods as they did in the past, when the state had a scanty rainfall during the monsoons. Ex-servicemen dejected at low turnout? Hopes of ex-servicemen of the area of getting good re-employment opportunities through interaction with industrialists dashed to the ground today when only four of the 150 industrialists, invited for the interaction turned up for the event at Punjabi Bhavan today. The reason given for the abysmally low turnout was that the industrialists were not used to getting up so early or to attending functions in the morning. They work late till night and have requested that in future such functions should be organised only in the evenings. Ex-servicemen who came to attend the seminar were visibly dejected at such turn of the events. They said if the industrialists could not make minor adjustments in their routine to help people who had devoted much time of their life in guarding the frontiers then they don’t have high hopes of getting employments from them. The function was, however, conducted as per the schedule. The four present industrialists and officers of the local Army units interacted with over 100 ex-servicemen, who had come from different parts of the state for the function. The chief guest, Air Marshal Manjit Singh Sekhon (retd), while speaking on the occasion said the ex-servicemen fraternity had a vast response of trained, honest, hardworking and progressive people. They were trained in technical and non-technical fields. They had proved themselves in war and in peace, from earthquake in Gujarat to floods in Assam and cyclone in Orissa. Brig J.S. Jaswal while welcoming the guests stated that ex-servicemen who had sacrificed their lives for the security and well being of the society needs to be given an opportunity by the society and particularly by industrialists to utilise their energy. Mr Anurag Aggarwal, Deputy Commissioner, in his inaugural address highlighted the services rendered by the ex-servicemen and assured that their interests would be taken care of by the Punjab Government. Air Marshal Sekhon highlighted the positive aspects of the personality of the ex-servicemen and urged the industrialists to employ them in a large number. The Sadar police today arrested nine persons in connection with the Phullanwal-Dhandra land grab case in which one man was killed and three others were injured. These persons were absconding since then. The nabbed persons include one woman also. The FIR mentioned the names of these people. At least 8 other persons are also wanted in the case but their names were not specified in the FIR. Police sources said the 8 persons would be identified with the arrest of these accused. The persons nabbed today during raids from different places have been identified as Rajinder Kaur, Nahar Singh, Sukhdev Singh, Amarjit Singh, Harbhajan Singh, Darshan Singh, Shamsher Singh, Zora Singh and Mohini. The incident had taken place on December 6. As the nation prepares to commemorate Vijay Divas on December 16 to pay rich tributes to war heroes, who laid down their lives fighting for the country’s honour in 1971, the city is also preparing to mark the historical day on Monday. 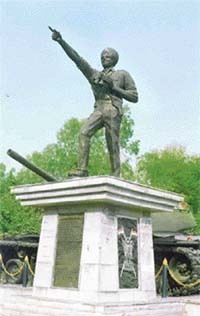 The models of the tank, fighter plane and the statues of the war martyrs of the 1971 war put up outside the mini secretariate here are being given a fresh look in view of the Vijay Divas which is commemorated in memory of the martyrs who laid their lives for the protection of the frontiers of the country during 1971 war. Vijay Divas is commemorated every year on December 16. A team from the Halwara Air Force Station was in the city today and was repainting and cleaning the memorials of the various defence personnel put up outside the mini secretariat. The models of tanks and planes were painted afresh today and the statues would be cleaned and repainted. 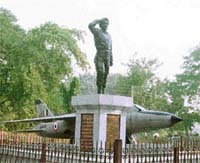 The day is observed by the district administration every year outside the mini secretariat and the statue of Flying Officer Nirmaljit Singh Sekhon and Major Bhupinder Singh, who lost their lives fighting for the country in 1971 Indo-Pak war, are garlanded. On the occasion of Vijay Divas, the city residents are all set to remember the great soldiers of the nation, who made the city proud. Flying Officer Nirmaljit Singh Sekhon, who belonged to Issewal village, was decorated with Param Vir Chakra posthumously. The sublime heroism, supreme gallantry, flying skill and determination above and beyond the call of duty displayed by Flying Officer Sekhon in the face of certain death had set new heights in the Air Force traditions. He was a pilot of a Gnat detachment based at Srinagar for the air defence of the valley against Pakistani air attacks. On December 14, 1971, Srinagar airfield was attacked by Sabre aircraft. Flying Officer Sekhon was on duty at that time. Immediately, nearly six enemy aircraft were overhead and they began bombing the airfield. In spite of the danger of attempting to take off during the attack, Flying Officer Sekhon took off and immediately engaged a pair of the attacking Sabres. In the fight that ensued, he secured hits on one aircraft and set another on fire. By this time other Sabre aircraft came to the aid of their hard-pressed companions and Flying Officer Sekhon’s Gnat was again outnumbered, this time by four to one. Even though alone, the Flying Officer engaged the enemy in an unequal combat. In the fight that followed, at tree top height, he almost held his own, but was eventually overcome by the sheer weight of numbers. His aircraft crashed and he was killed. Major Bhupinder Singh set an inspiring example of personal sacrifice and bravery in the best traditions of the Indian Army. Major Bhupinder Singh, Squadron Commander, Hodson’s Horse, led his squadron with distinction in the battle of Phillore and Sodreke in Pakistan between September 11 and 19,1965. With skilful deployment and bold action, his squadron was able to cause large-scale destruction of Pakistani tanks and other equipment. Although his tank was hit on several occasions, he continued to remain in affective command and, by several acts of personal gallantry, inspired his men to fight courageously. On September 19, 1965, in the battle of Sodreke his tank was hit and caught fire. While abandoning the tank, he was burnt severely and died. An attempt by three car-borne youths to abduct a minor girl from Kitchlu Nagar last evening was foiled by the timely action taken by a woman living in the neighbourhood of the girl. According to information, the minor girl was strolling outside her house, along with her aunt, when the three youths arrived in a white Santro car. When they tried to drag the girl into the car, she resisted their efforts and raised an alarm. A woman living in the neighbourhood rushed to the rescue of the crying child and somehow managed to foil the kidnapping bid. As the registration number of the car had been taken down and the police informed about it, the car was later nabbed by the PCR motor cycle cops at a roundabout in the city. Robbery bid, one held: One of the two youths, who tried to commit robbery in a jewellery shop in Ghumar Mandi last morning, was nabbed on the spot while his accomplice escaped with a pair of gold bracelets from the shop. According to information, two youths came on a motor cycle to the shop on the pretext of buying a gold bracelet. One of them went inside the shop while other remained outside. It was while the shopkeeper was going to weigh one of the bracelets that the youth picked up a box containing five bracelets and made for the motor cycle parked outside the shop. The shopkeeper raised an alarm but the youth on the motor cycle could not start the vehicle on time. One of youth fled with a couple of bracelets . Three bracelets fell on the ground near the motor cycle. The nabbed youth, identified as Ajit Singh, was handed over to the police. According to preliminary investigations, the youths belong to Patiala. Factory workers booked: The Focal Point police has registered a case under Section 304 of the IPC against 10 to 15 workers of the Anand Forging Factory at Dhandari Kalan, who had allegedly beaten up Ramesh Kumar, after some migrant labourers had made a theft attempt in the factory a few days ago. In the FIR, Focal Point SHO, Mr Sandip Kumar Vadhera, stated that after catching Ramesh Kumar, the factory workers subjected him to severe thrashing before informing the police. When the police was informed, it brought the culprit to the Dhandari Kalan police post and booked hin under Sections 457 and 380 of the IPC. But the beating proved too much for the victim and he died during the night at the police post. Meanwhile, ASI Surinderjit Singh, in charge of Dhandari police post, has been placed under suspension for dereliction of duty. The officer did not handle the case with the seriousness it deserved, said a higher police official. Held for jamming traffic: The division number three police has registered separate cases under Section 283 of the IPC against two persons on the charge of obstructing traffic. While Harpal Singh, a resident of New Janta Nagar, was arrested for parking his three-wheeler on the road and jamming the traffic. While Jaspal Kumar, a resident of Vijay Nagar in Basti Jodhewal, was arrested on charge of parking his Tata-407 vehicle on the road and jamming the flow of the traffic. Both the offenders were later bailed out. Beaten up: The division number five police has registered a case under Sections 323,341 and 506 of the IPC on the statement of Mr Vinay Mehra, who resides near the Bharat Nagar Chowk, against Kuldip Singh, who lives in the same area. The complainant had alleged that the accused intercepted him on the way , beat him up and also threatened him. No arrest has been made so far. Two lovers ended their lives by jumping in the Sutlej river from the Ludhiana-Jalandhar bridge today evening. Quite similar to the Sukhna lake suicide incident in Chandigarh, the lovers had tied their arms with a piece of cloth. The bodies were fished out of the river by police officials on security duty at the bridge. The identity of the deceased couple could not be ascertained as no papers were found in their possession. The police could only get some clues that the couple was from Peeng village near Phillaur. According to sources, the woman was married and had two children also. “Bharat Sanchar Nigam Ltd (BSNL) is committed to provide good quality service to its customers and we shall continue to strive hard to achieve this objective”, said Mr G.S. Julka, General Manager, Ludhiana Telecom, while inaugurating 23rd cash counter at Dugri Telephone exchange here today. According to Mr Julka, there had been a tremendous response to mobile phone service of the BSNL and till date 9000 mobile connections had been released in the city which included 5500 post-paid and 35 pre-paid connections.